Co-Codamol Tablet 8/500 is a private prescription item. To purchase this item you must have a private prescription from your doctor or medical profession. If you require any help or assistance with purchasing Co-Codamol Tablet 8/500 please contact our pharmacy team. 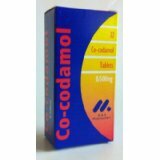 Please take Co-Codamol Tablet 8/500 as prescribed by your doctor or medical professional. Direction details will be available on your medication container. Please contact your doctor or medical practitioner to understand more about the side effects of taking Co-Codamol Tablet 8/500.